At this time when monsoon rains haven’t ceased pouring and floods devastate various places all over the Philippines, you need to know whom or where to seek for weather related emergency assistance. Naturally, your first resource includes family, relatives, or neighbors and friends. But if they’re as helpless as you are, then you should be aware of other sources to ask help from for medical needs or rescue missions. If you can send anyone safely to a government official or office, then do so. Otherwise, make a call to any office or official you are able to reach. 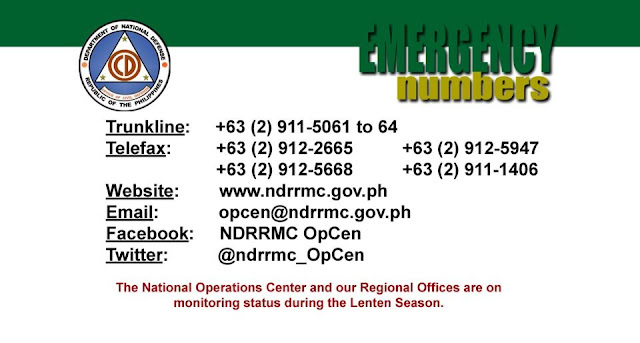 NDRRMC can be reached through the following options below (see image). I’m sure that they can also connect you to a PDRRMC hotline in case you live in the provinces. The Philippine Red Cross is a notable NGO but it’s only one among many. Church organizations are also approachable when it comes to disaster assistance. Television channels, radio stations, and print media also openly help in times of need. I’d also like to include PAWS or Philippine Animal Welfare Society for animal related assistance as they have openly expressed their willingness to temporarily shelter your pets if your home has been ravaged by flood. Please refer to this page from gov.ph for emergency hotlines numbers which include NDRRMC, the Philippine National Police (PNP), Bureau of Fire Protection (BFP), Red Cross, and LGUs - www.gov.ph/emergency-hotlines. Apart from these, you should also have phone numbers of important offices handy including the nearby hospitals or medical personnel at least as well as your local fire and police station.